Today I will be reviewing the book series Amulet by Kazu Kibushi. It's about a girl named Emily who finds a very powerful magic amulet in her great-grandfather's house. 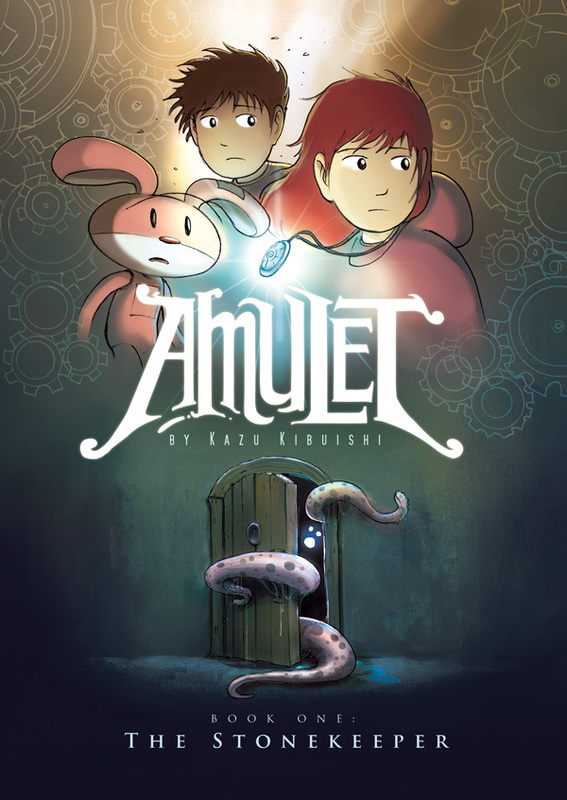 Soon after she finds the amulet, her mother is kidnapped by strange octopus creatures who take her to an alternate dimension that's a mix between steam punk and fantasy. When the creatures leave, Emily and her brother, Navin, follow them, in an attempt to save their mother. In this world, she meets her great-grandfather on his deathbed. His robot servants agree to help her find her mother. I think the first book is a bit too slow because there isn't enough time spent in the alternate dimension, but after that, everything is perfectly paced. There are four story lines that are constantly switching and coming together. The story of Emily, the story of her brother, Navin, the story of one of the villains, Max, and the story of Miskit, Emily's great-grandfather's main robot. The art in these books is pretty good. It looks like an American version of manga. I also love all the steampunk things like robot houses and zeppelins. 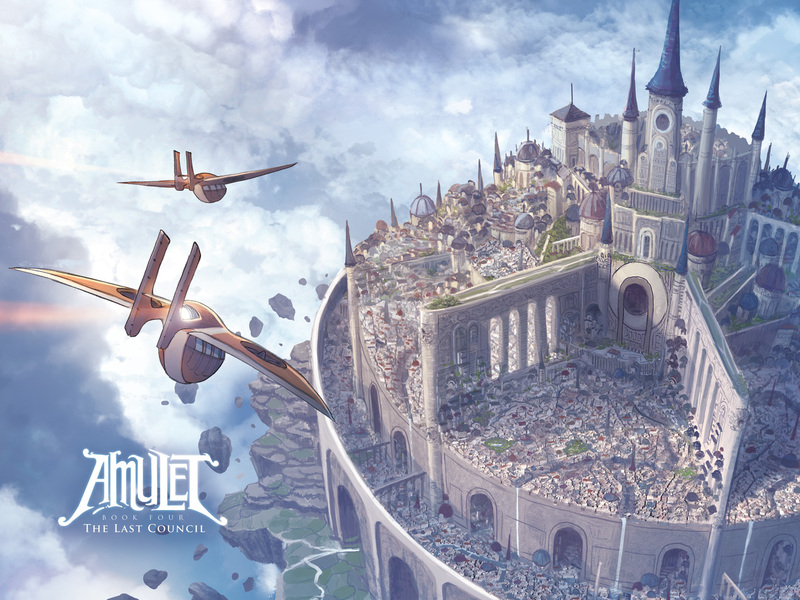 There are some characters in Amulet who are very strong and some who are not. At first, Navin is just the generic little brother, but later on in the series, he becomes a perfectly supportable character. He becomes less like the generic annoying nine-year-old brother and more like a mature fully grown warrior. I think that Emily is a great character. She's just enough badass hero and just enough immature teenager. I like how she's not invincible like some main characters. 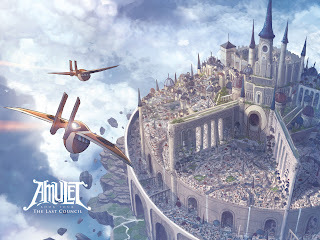 In all, I think that Amulet is a wonderful book series. It's enjoyable for all ages and I've read each book multiple times. I can't wait for Book Six. I would give Amulet 4 1/4 robot houses out of five. I'm intrigued. Who's the pink bunny on the cover? Perhaps I should read the books to find out. "I like how she's not invincible like some main characters." Yup, very big selling point. I like to feel like I can hang with the main character, and I don't feel that way if they're perfect. I loved your review. It's so clearly written. Even though I've never read this series I got a very clear idea of the setting, the plot, and the characters. Badass hero/immature teen? Great combo. And the fantasy elements of the story seem interesting and fun. So cool that the art looks like "an American version of Manga." The examples you posted really grabbed me. Have fun with Book Six! Milo - Excellent review! Clear, succinct, and balanced! I particularly love your description of Emily as "... just enough badass hero and just enough immature teenager." A few words, and I know who she is. Well done!